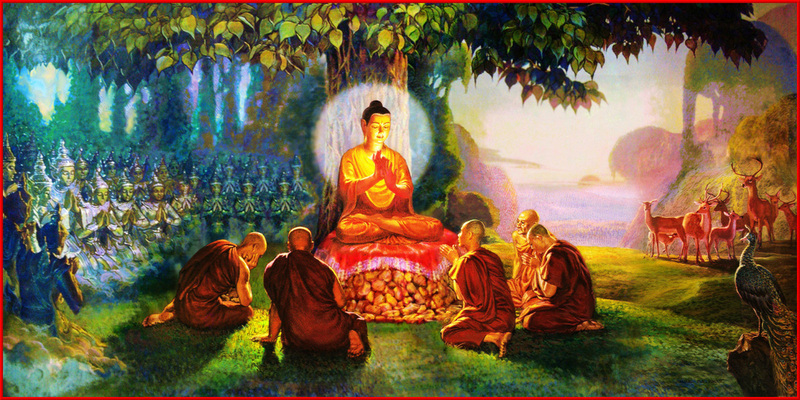 Buddha Shakyamuni gives his first teaching on the Four Noble Truths to the five monks at the Deer Park in Sarnath. Join us for Chokhor Duchen, one of the four annual holy days of Guru Shakyamuni Buddha. Known in English as Turning the Wheel of Dharma, Chokhor Duchen commemorates the anniversary of Guru Shakyamuni Buddha’s first teaching. It is recounted that for seven weeks after his enlightenment, the Buddha did not teach. After this period, Indra and Brahma offered a dharmachakra and a conch shell and requested Guru Shakyamuni Buddha to teach. Accepting, Guru Shakyamuni Buddha turned the Wheel of Dharma for the first time at Sarnath by teaching the four noble truths. This year, we are celebrating according to Indian time. Per the late Ven. Choden Rinpoche, one of Lama Zopa Rinpoche’s gurus, observation of auspicious days should be according to the date in India, not the date in one’s home country. As merit is multiplied a 100 million times on this holy day, it would be an excellent opportunity to follow Khadro-la’s advice that students of Lama Zopa Rinpoche offer recitations of the Vajra Cutter Sutra and Dependent Arising: A Praise of the Buddha (Tendrel Topa) for Rinpoche’s long life.